Temperatures here in Vegas have been over 100 degrees for the past week and a half or so. We're enjoying a cooler day today. The high is only supposed to be 85 or so, but the heat should return in no time. There is no way that I am going to survive this summer in jeans & denim capris & my wardrobe is seriously lacking in the skirt department. 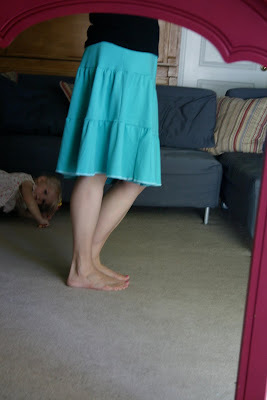 So, I'm on a mission to fix that & get myself outfitted with some breezy skirts this summer. 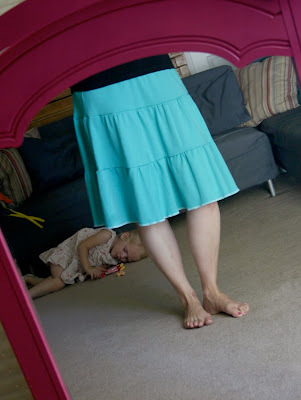 I started with this aqua three tiered skirt. I was able to start & finish it yesterday afternoon. I wasn't sure about it when I finished it. I modeled it for Dylan when he got home & he gave it the thumbs up. Still, I kept bothering him..."Are you sure it's okay? Is it too blue? too short? too poofy? too homemade looking?" He reassured me it was fine & I let it go. This morning when I tried it on I was super, super happy with it. Don't know where the doubt came from the night before. I made it in a jersey knit which makes it super comfortable. I used the Simplicity 2609 pattern which I picked up at Joanns for $1.00 over Memorial Day weekend. The fabric I had purchased a while back on sale for around $3.00 per yard. 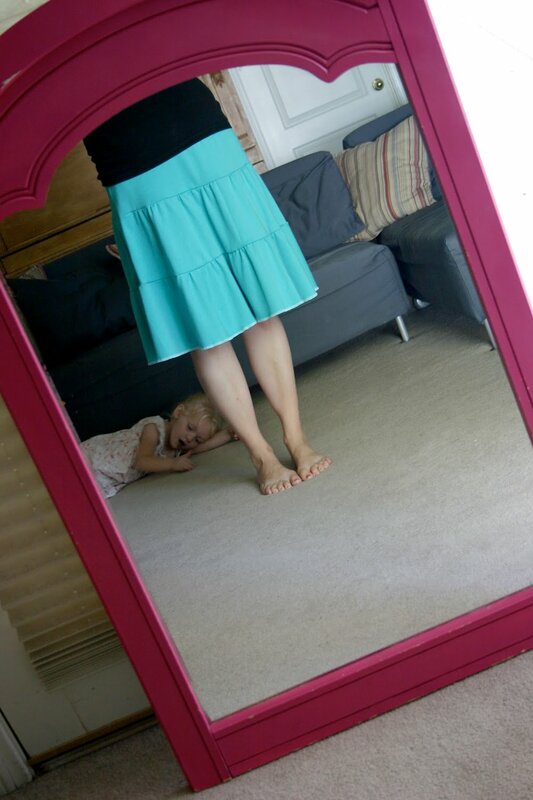 I'm estimating that the total cost of this skirt (including the pattern) was around $6.00. Plus I think that I'll definitely be making another, so that $1.00 pattern will stretch even further. Hooray for sewing something for myself! ooh, looks really perfect for the summer! i love that (and your new profile pic!) if you sold them i would buy one for sure! cute!! Super cute! And the color is perfect for summer. Hurray for skirts! Very cute! I've been wanting to make one for myself too. ahhhh!!! i want to do everything you do. at least we don't live in the same town or you'd probably get the heebie-jeebies seeing me and my kids follow you around to find out where you're going for lunch and what library books you're checking out. now i'm honestly probably going to go look through your new flag garlands and consider going blonde. ARE YOU KIDDING ME??? THAT IS THE BEST LOOKIN SKIRT EVER!!!! HOLY MOLY I LOOOOOOOOOOOVE IT!!!! maybe one day when i am not a 75inch waist you can make me one- and i swear if you tell me i can do it myself im gonna punch you! can't wait to see what other cute ones you make. I think it is way cute. I need to make some for me too...although our weather here in Pittsburgh isn't nearly as hot. I feel like when it is 85 it it too hot. Your 100 sounds unreal. It's perfect! The best shade of summery blue.